Business and retail crime can be taken to include ‘all crime and disorder committed by or against businesses.’ The definition is extremely broad, covering internal crimes (e.g. employee theft, fraud and false accounting); external crime (e.g. burglary, customer theft and vandalism) and contraventions of legislation, for example on trading standards or health and safety. The purpose of this toolkit is to explain the partnership approach to addressing business crime and the current initiatives being taken forward by the Safer Neath Port Talbot Partnership. Both Neath and Port Talbot town centres have achieved the Safer Business Awards. This is a prestigious award granted by Action Against Business Crime which is a Home Office supported organisation. The Awards recognise the amount of work and commitment by the Partnership in the fight against retail and business crime. The Safer Neath Port Talbot Business Crime Reduction Partnership was launched in October 2005. At present there are two schemes, one in Neath town centre and one in Port Talbot town centre. Both schemes are now firmly established with members from the retail and the business sector in Neath Port Talbot. Photographs of known local offenders are distributed to the inclusion panel made up of members of the scheme and officers from the partnerships to decide on the length and terms of each individual exclusion. 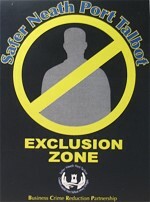 All the members of the Safer Neath Port Talbot Business Crime Reduction Partnersgip display Exclusion Zone stickers so that offenders that have been excluded by the members clearly know where they can and can not go. The Safer Neath Port Talbot Partnership is working in conjunction with M-R-S Communications Ltd and members of Store Net to reduce criminal activity for retailers by using the Store Net communication network. Store Net is a two-way radio system that links all participating retailers in Neath and Port Talbot to each other, Police, and CCTV Control unit. The radios enable the rapid dissemination of information on criminal activity throughout the area, so that the security staff is fully aware of their movements, descriptions and direction. Other radio users are alerted, and the system will allow staff to pursue criminals in the area and still remain in contact with other security staff who could provide assistance if required. In the event of a member of staff or security officer being attacked, the system has a built in panic button which, when activated, sends the identity of the security officer/ staff member in difficulty to all other radios on the system. The microphone is automatically activated for 30 seconds, thus enabling the user to have a ‘hands free’ facility. The main aim of Store Net is to reduce crime, the fear of crime and ultimately improve profitability for the member through a decrease in theft and damage. This is a similar scheme to Store Net but Night Net is for members of the nighttime economy. Pub watch is successfully operating in Pontardawe, Neath and Port Talbot. The basic working principle underpinning a Pub Watch scheme is that the licensees of the premises involved agree on a number of policies to counter individuals that threaten damage, disorder and violence or use or deal in drugs on their premises. Normally action consists of refusing to serve that cause, or are known to have caused, these sorts of problems. Refusal of admission and service to those that cause trouble has proved to be effective in reducing anti-social behaviour. Secured-by-Design is a police initiative to encourage the building industry and designers to adopt crime prevention measures in the design of buildings to reduce the opportunity for crime and the fear of crime, creating a safer and more secure environment. In April 2005 the Neath Civic Centre achieved Secured by Design status. The new Neath Civic Centre offices were designed by the council's in-house architectural team, who have worked in close liaison with the South Wales Police Force architectural liaison officer, to achieve this very high standard of security, both within the building and the open public spaces surrounding the civic centre. A partnership approach is essential to address business crime.